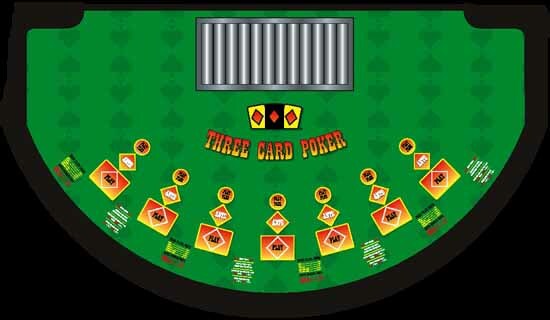 The game of 3 Card Poker is played between a Dealer and a Player with a 52-card deck. 3 Card Poker is two games consisting of the Ante and Raise and Pair Plus. The object in the Ante and Raise portion is to receive a higher 3 card poker hand than the Dealer. The object of the Pair Plus game is simply to bet on whether you will receive a 3 card poker hand with any pair or better. The Player may bet on either or both games for any amount within the posted table limit. The bets do not have to be equal amounts. The Pair Plus is won if the Player's hand is dealt a pair or higher. The Pair Plus bet is a separate bet that is not measured against the Dealer's hand, it is paid out based on the rank of the hand dealt (see chart below). If the Player bets on the Ante and folds the hand, the Pair Plus bet is also forfeited. Ante - If the Player 3 card poker hand outranks the Dealers hand. Or if the Player Raises and the Dealer does not qualify with at least a Queen. Raise - If the Players 3 card poker hand outranks the Dealers hand and the Dealer qualifies by having at least a Queen as a high card. Pair Plus - If the Player is dealt a pair or higher. Ante - If the Player folds or the Dealer has a higher ranked 3 card poker hand. Pair Plus - If the Player does not receive a minimum of a pair, when dealt three cards.